Our home living range includes a beautiful selection of cushions, bedding, silk floristry and bronze ornaments to choose from. Renew your home accessories, find the perfect gift or accessory for your home and enjoy browsing through huge range! Oak furniture is a classic favourite of ours. We stock some high quality brands of furniture and in many different styles. 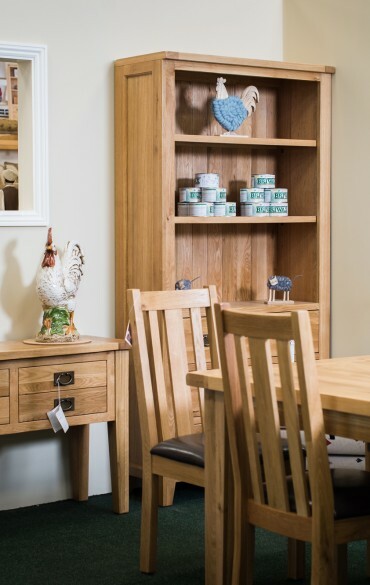 Why not come and explore our oak collection yourself and find something that fits in perfectly with your home. In our Home Living section you’ll find many beautiful ranges of soft furnishings for your home. We have cushions, bedding, linen and other accessories to complete every room. Come and see our range for yourself. At Gates Garden Centre we have a selection of lovely bronze ornaments for you to browse and buy. Making a lovely addition to any home, why not see if you can add something different to your ornament collection. They also make ideal gifts. We stock a wonderful range of luxury toiletry items, from soaps and sponges to hand creams and candles. We always support local companies where we can and have a wide range toiletry items that would make ideal gifts. Why not come and see our extensive range for yourself? Silk floristry adds a little luxury to any room, it is also floristry that lives forever. Why not treat yourself and your home to some luxury colour? Come and see the beautiful range that we have in store.